Managing Director at Florijnz Corporate Finance B.V. Founder and director of Florijnz is Hans Minnaar. 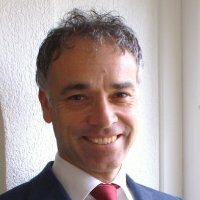 Hans (1969) is a financial generalist and studied Econometrics at Tilburg University with a specialization in financing. During his working period at ABN AMRO he gained his NIMA A and B. Furthermore, he got his Register Valuator degree at Rotterdam School of Management and is registered as certified company valuator at SWBO corporation. In 17 years of financial working experience at ABN AMRO and Fortis he has gained much expertise which he now uses for entrepreneurs. He has a very broad network of financial professionals in the south and southwest of The Netherlands. Since 2012 he is also chairman of the national network for merger and take-over specialists, the Dutch Corporate Finance Association. From this position he has a good view on the developments of the market. Core qualities are quality-aimed, passion, feeling for matching, communication, creative, involved, insight in figures, and hands-on.